PUT ANY ONE above photo with cutting. AMTECH offer pressure reducing valve with minimum tolerance of results .The valve can be operated by pneumatic diaphragm type, Spring & Diaphragm type neoprene rubber diaphragm with canvas reinforced ,Viton Diaphragm and Silicon Diaphragm. All Pressure Reducing valves Pressure controller are in different range as requirement.The function of valve automatically reduces a higher inlet pressure to a constant lower outlet pressure. Pressure Reducing Valve controls /maintains a pre -set - reduced downstream (outlet) pressure by causing the main valve to throttle and sustain the desired reduced pressure regardless of variations in demand and upstream (inlet) water pressure. 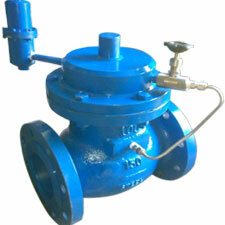 There are two types of water/OIL/GAS/STEAM pressure reducing valves Diaphragm acting and pilot operated. Both types are using globe or angle style bodies. Pressure Reducing valves consist of globe-type bodies with a spring-loaded, heat-resistant diaphragm connected to the outlet of the valve that acts upon a spring. This spring holds a pre-set tension on the valve seat installed with a pressure equalizing mechanism for precise water pressure control.